3.5 billion. That’s the average number of Google searches performed each day. People turn to Google for instant answers, whether that is to figure out what actor was in that movie you wanted to see, or what company to hire to clean your gutters. Searchers are out there and that thing they’re looking for just might be your company. 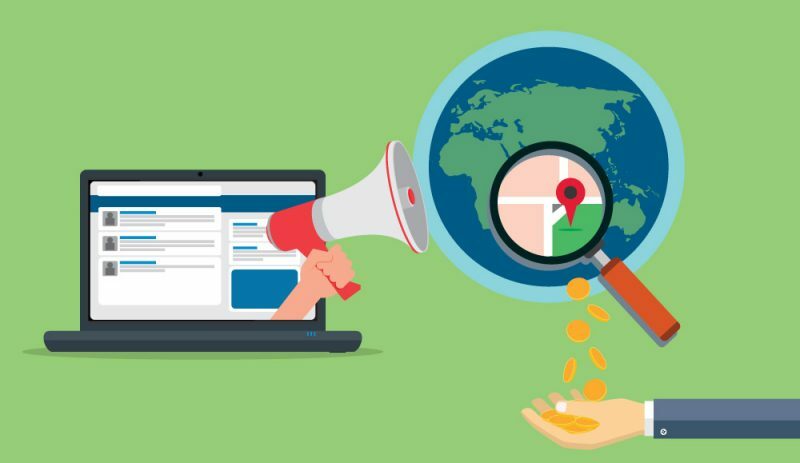 Are they able to find your business based on a local search, or are your competitors one-upping you in their local SEO efforts? You’ve probably heard the term local SEO a few times recently. With an increase on local and “near me” searches, Google is looking to better their local results. Google is constantly striving to fulfill users’ search needs, providing the most relevant and correct information possible. That’s why if your business information is hard to find or incorrect throughout the web, you might not be showing up in search results at all when you could be dominating the market by starting with the basics. With some slight changes to your Google My Business listing consistency, some local links to your website, and a little review generation, you could increase your rankings and revenue! Fill out a form today for a FREE local SEO analysis for your business. Google My Business (GMB) is the upgraded version of Google Places for Business and Google Plus. If you added your business via Google Places or Google Plus, you’ve been automatically upgraded to GMB. You can verify your business listing via phone call or a post card sent to your business address, allowing you to make changes, monitor reviews, and engage with brand followers. It can be hard to keep up with the constantly changing nature of Google, but the impact it can make on your bottom line is worth the investment of time. Claim your listing. A study by Moz listed “claiming your Google My Business listing” as #13 in ranking factors for local search results, although simply claiming the listing may not be the only factor affecting ranking. Many business owners add to or correct the information after claiming their listing; but the first step to making changes is verifying your business, which you can learn more about in the Google My Business Help forum. How Can I Get My Business to Rank in the Local Pack? [near me] or [sykesville md], and sometimes they will be inferred by Google when Google’s algorithm anticipates a local search based on the keyword used. For instance, if someone is searching for “pet store hours”, they’re probably looking for the hours of their local pet store so they can pick up a bag of dog food before Buster starts chewing on the couch legs again. Us Marylanders sure do like our crabs, so I also did a search for “crabs near me.” This gives you a little more insight on how Google assumes what the users intent is. I’m not looking for places to go crabbing, I’m looking for a restaurant near me that sells crabs. 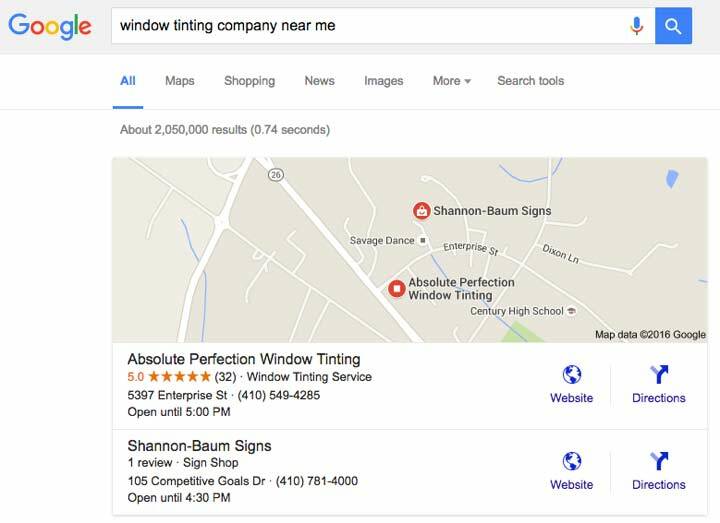 Now, check out how some of these listings are ranked based on the performance of their Google My Business listings. As you can see, Google takes the number of reviews and star rating into factor when showing local pack listings. 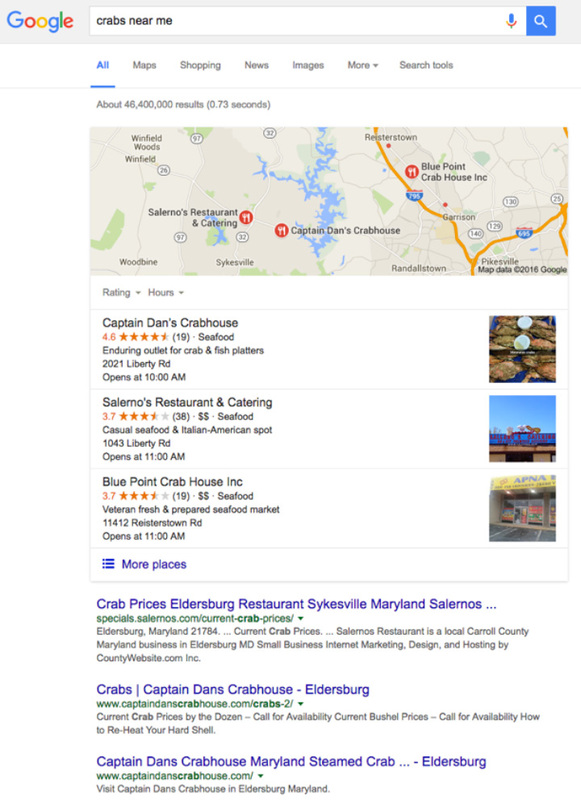 Captain Dan’s Crabhouse is ranked #1 due to the highest star ranking of 4.6. Although Salerno’s Restaurant & Catering has 38 reviews compared to Captain Dan’s 19 reviews, their star rating is lower coming in at 3.7 stars. Finally, Blue Point Crab House Inc has the same rating as Salerno’s at 3.7 stars, but they have fewer reviews. Below the local pack listings, you’ll also see that the top 3 organic listings are coming from the first two businesses ranked in the local pack. Your Google My Business listing consistency, ratings, and the number of reviews are important for SEO and ranking locally in your service area. Why wait? Those star ratings could be losing you money!